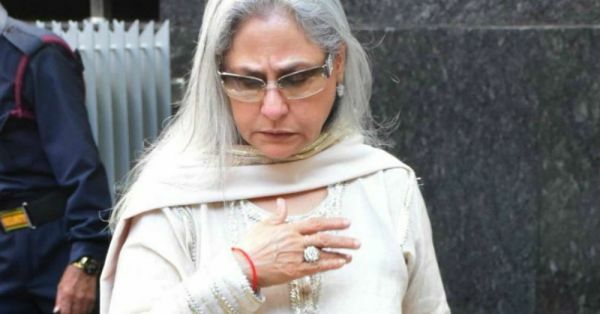 Bollywood veteran Jaya Bachchan attended the birthday brunch of Hiroo Johar, Karan Johar's mother last evening. Famous Bollywood celebrities like Salman Khan's mother Salma Khan, Sushila Charak and Sharmila Tagore were also present at the brunch, and the video of Hiroo Johar's emotional speech is doing the rounds on social media. But what made news was Jaya Bachchan. While leaving the party, the Kabhi Khushi Kabhie Gham actress was surrounded photographers and paparazzi at the gate, whom she gladly posed for. However, she spotted a few men taking pictures of her on their mobile phones and was quick to call them out and asked them to stop. She even went on to say, "Have you asked for my permission?" leaving them dumbfounded. This isn't the first time that the Member of Parliament has objected to being photographed. Jaya Bachchan frequently coaches the photographers on etiquette and tries to get out of taking selfies. On Koffee With Karan, son Abhishek Bachchan confessed that watching videos of his mom blasting the paparazzi is his guilty pleasure. On the other hand, Shweta Bachchan came to her defence and said that she doesn't like getting clicked without permission and feels claustrophobic when too many people are around. Hiroo Johar celebrated her 76th birthday on March 18 and here are all the pictures from her party. We hope to see more of Hiroo Johar at the premiere of Kalank, Karan Johar's next film starring Alia Bhatt, Varun Dhawan, Sonakshi Sinha, Aditya Rao Kapur, Madhuri Dixit and Sanjay Dutt which will hit the silver screen on April 17.